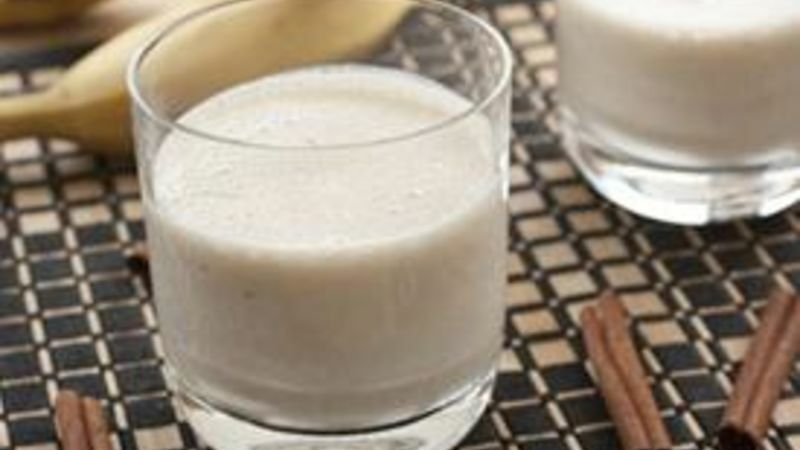 Slice banana and add to blender with Greek yogurt, milk, ice, and cinnamon. The milk and ice help to thin out the lassi a bit and also make sure that it's super-cold. Serve immediately. It goes great with hot dishes like curries or works as a quick breakfast or dessert. What if I told you there’s a drink out there that can be a breakfast, a dessert, or a side dish? What if I also told you that it’s really simple to make and you probably have everything you need to make it right now? If you aren’t excited about this, then I don’t know what to tell you. The truth is that this Banana Lassi recipe fits all those things. Lassi is a traditional Indian drink that can be sweet or savory and is served by itself or occasionally alongside spicy stuff. While I love this drink for breakfast and dessert because it is slightly sweet, I really love it to drink along with a really spicy meal – like curry. It completely quenches any heat that a dish brings, allowing you to really go for broke with the spiciness. There are a million varieties of lassi out there, but I like mine with banana. To make one drink you’ll need a whole banana and about a cup of thick Greek yogurt. The only thing you need to really prepare for this recipe is a sliced up banana. It’s pretty beginner on the knife skills scale. Just toss these things in a blender with the milk, ice, and cinnamon. There’s no need for any salt or sugar in this drink. It’s perfectly sweet and flavorful without any additional stuff. The ice and milk help thin it out a bit and also make sure that it’s really cold. It’s not quite a milkshake, but it’s pretty close. This recipe makes either one large lassi or two smaller ones. Frankly, I’ve never had a problem downing one of these by myself. For as simple and easy as this recipe is, I think you’ll really be impressed by the results. It’s a pretty healthy dessert if you just want to quench your sweet tooth, but the real power of it comes alongside some spicy food! Nick wishes he could mail you one of these right now along with the hottest curry ever just so you can experience the coolness. Be sure to check out his blog, Macheesmo, his book, Cornerstone Cooking, and check out his Tablespoon profile.